Hi, I am interested in your 2014 Harley-Davidson Touring (stock #B2331 R) listed on Autotrader for $12,900. I'd like to get more information about this vehicle and confirm its availability. A classically styled touring motorcycle, the 2014 Harley-Davidson Road King serves either one or two occupants with a smooth highway ride. Aerodynamics for the 2014 Harley-Davidson Road King has been tweaked to reduce the effects of the wind to riding comfort. A detachable windshield is also equipped on the for protection. Other changes made to the Road King include a new front fork suspension, fuel tank as well as a revised control layout for better ergonomics. Also improved for 2014 is the Twin Cam 103 engine of the Harley-Davidson Road King. Still propelled by a 1,690 cc V-twin engine, the Road King is boosted for better road-going performance. The Road King features two-up seat design, One Touch hard saddlebags at both sides, full-length footboards, cruise control and an air-adjustable suspension system. GR Auto Gallery is pleased to present this lovely touring bike for your consideration. With just 13k miles since new, this bike is in fabulous shape. Powered by a 103cid V-twin, this bike is smooth and offers excellent performance. It is fitted with a number of upgrades such as Kuryakyn velocity stack intake, beachcomber bars, lamp visor, rear LED turn signals, chrome rails around saddle bags, retro white rubber kit, bag liners, and extra chrome. This big rides just like it did from the factory and features a new battery, a recent full dealer service, and a filter and fluid flush. 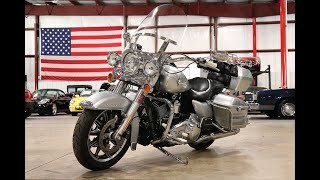 A great bargain compared to a new bike, this Road King is sure to please.